Scooters and electric scooters for the street and the skate park. Electric scooters are large, self-propelled models, while the classic scooter needs the help of the user to move forward. Choose the quality of the wheels' bearings, how many wheels you want, and frame material. Handbrake, foot brake, and a bell increase the safety. An adjustable steering wheel makes the ride more comfortable. Scooters are a fun way of getting around, both for young and old. Regardless of whether you’re using it for fun or as a way of transport to get to work, there are scooters that are catered just for you. Here we’ll help you choose the right one. 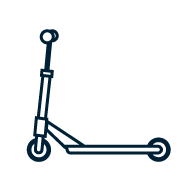 There are mainly three types of scooters, ones suitable for play, trick scooters, and those used as a mode of transport. Scooters for play: These are the simplest models with handlebars that can be raised and lowered. You can often collapse the scooter so it takes less space in the car, and they are generally cheaper than trick scooters and transport models. Trick scooters: These are better built, with higher shock resistance, than the models intended for play. They cannot usually be folded or the height on the handlebars changed. They also cost more than scooters for play, but are more suitable for jumping on ramps and on fast rides. Scooters for transport: These are bigger and heavier than the other two variants, have bigger wheels and are more comfortable to ride. These types of scooters must not be used on ramps and the like as they are not built for it. Sometimes they have electric motors, helpful if you don’t want to use your legs. There are models that combine all the different types of scooter. For example, trick scooters with adjustable handlebars that can be folded together. 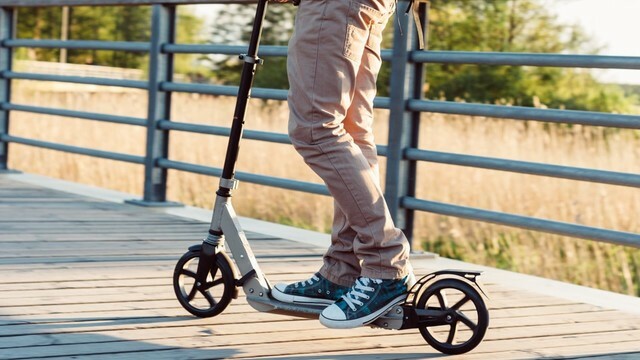 They have less durability than proper trick scooters, but cost less and are good for those who do not want to invest in the more expensive models. Large wheels create a higher maximum speed, while small wheels increase acceleration and control. Scooters are adapted for a certain wheel size. If you buy a model with small wheels, you may not be able to swap to bigger wheels later. The core: The centre of the wheel where the wheel bearings are located is called the core. There are three main variants to look for: the solid core, the spoked core and the hollow core. The solid core is heaviest and lasts the longest. The spoked core is the lightest, but has the worst durability. The hollow core is both light and durable. Profile: The profile of the wheel means the shape of the wheel's cross section, or how sharp the shape of the wheel is. A sharper profile reduces contact with the surface, which means you can go faster. A broad profile causes more contact with the surface. This gives you better control over the scooter, but also reduces the speed. Hardness: The harder the wheels are, the less they wear out. Hard wheels can handle a heavier body weight and increase speed. Softer wheels grip the ground better and absorb shocks better. Hardness is measured in A-numbers between 0 and 100. You’ll have a better body posture and reduce the strain on your back with a scooter that has adjustable handlebars. Models with a fixed handlebar height last longer when jumping on ramps and doing tricks that demand more from the scooter than with normal usage. An adjustable handlebar is easiest to lock with a quick lock. Models with screw-locking last longer. Folding scooters can be folded together so they don’t take up the same amount of space, for example, if they are going in the car. Cheaper models often have a quick lock which allows you to quickly fold the scooter. More expensive models use one or more bolts that are more durable. Folding scooters are not as good as those with a fixed frame and can sometimes feel a bit unstable. Most scooters are not adapted for use in wet environments. If you drive in puddles or are out in rain, the wheels must be taken off and dried, otherwise, there is a risk that the ball bearings in the wheels will rust and break. Once the wheels have dried, lubricate them with ball bearing oil. All scooters have a rear brake that stops the wheel from spinning when you press the brake with the foot. It’s important that you don’t press the foot too firmly so that the wheel locks. If the wheel locks at a high speed, the rubber may wear unevenly, which means that the wheels have to be replaced. You apply pressure with your heel to brake but not enough to cause the rear wheel to skid. There are also scooters with handbrakes. In addition to a brake, a secure-fitting helmet is necessary. Complement it with knee protection and elbow protection. Regularly check screws and wheels so that nothing is loose when you go for a ride. If the scooter has an adjustable handlebar, check that this cannot suddenly change height. Electric scooters use a built-in battery and a motor that drives the scooter forward. The laws for electric scooters are different from conventional scooters because they have built-in engines. Depending on the model, you can travel up to about 100 kilometres with a top speed of up to 30 kilometres per hour or more. Bear in mind that electric scooters weigh more than other scooters and require that the rider has a certain body weight to handle them. Sooner or later you’ll need to change the scooters’ bearings. If the wheels roll too slowly, have started to rust, or been used for more than a year, it's time to buy new ones. It’s important that you choose high quality bearings. Look for the ABEC quality label and choose bearings marked with ABEC-5 or higher. Ball bearings made of steel are more resistant to corrosion and rust but bearings with ceramic centre are even better still. Bearings that are lubricated with oil spin faster but if you prefer good protection against water and dirt, choose grease. Ball bearings are mounted in the wheel with a bearing press. You should definitely not try to insert them with a hammer or chisel because it can easily destroy the bearings. Two bearings are used for each wheel and with a spacer between them, they are mounted at the correct distance.